Having had the guts of three days to reflect, Gianluigi Buffon yesterday passed up the chance to apologise to Michael Oliver for suggesting the referee had a rubbish bin where his heart should be. Speaking on Italian TV last night, Buffon's biggest concession to civility was to acknowledge that his words might have 'seemed excessive' and were possibly a touch 'raw'. But he stood over them all the same. He'd do it again basically. His conduct has been heavily criticised in England where it's been pointed out that Oliver's wife has been subject to some disgraceful harassment on Twitter, on account of her husband's last minute decision. Gary Lineker and others have suggested that Buffon, given his stature and presumed power over the Juve fanbase, should make a statement and call off the dogs. Sinister though that is, that's not the full story as far as the Italian internet goes. The part of Italy that hates Juventus - which we're assured is a very big part of the country, fully two-thirds in fact - has made clear it has great time for the English official, with the hashtag #ItaliaLovesMichaelOliver catching fire on Italian Twitter on Thursday and Friday. One user tweeted out a split-screen picture of Michael Oliver alongside Guiseppe Garibaldi, the legendary hero of Italian unification (a man whom historian AJP Taylor has described as the only 'wholly admirable' figure in modern history) and asked followers to retweet or like depending on whom they preferred. Needless to say, Oliver is currently strolling away with it in that battle. Another big question is what the whole farrago has done for Buffon's legacy. The Juventus goalkeeper is one of the most admired figures in the game. Mere mention of his name can have even non-Italian neutrals swooning like Juve ultras. Like his compatriot Andrea Pirlo, he can't tie his shoelaces without a gang of hipster football fans admiring how he did it. (Miguel Delaney speculated on Twitter yesterday that the excessive adulation showered on Buffon and Pirlo is down to 'Italian cool'). But the last few days has shown us that an unseemly whingefest can do much to sour a man's reputation. Buffon's critique of Oliver's refereeing was incoherent and fairly cringeworthy. His tirade was certainly vivid and was littered - no pun intended - with memorable phrases, or at least phrases that stand out as memorable when translated from Italian into English. According to Buffon, Oliver was wrong to award the penalty because it was deep in injury-time and Juventus were on course to complete a beautiful narrative. Bizarrely, he suggested that the call indicated that Oliver lacked 'courage' rather than the opposite. Notably absent from his rant was any consideration of whether the actual refereeing decision at issue had been correct or not. Yesterday, he defended his post-match rant on Italian television. "Right there, you cannot ask a man who lives sport as deeply as I do to be balanced, because even if I expressed these feelings in an exaggerated way, they were still logical thoughts. I’d say them all again... I have to defend my team-mates and fans, even in a not very composed fashion, because I feel it. I had to let that out, even if it damaged my reputation," he said. Buffon getting it off his chest has achieved little only to make him look like a sore loser and diminish him in the eyes of the public. There's a lot to be said for dignified stoicism, one of the most underrated of all qualities. Oddly, the club Buffon has represented for the past 17 years has for decades prided itself on exhibiting those qualities. Juventus are still controlled by the famous Agnelli family - the proprietors of the mammoth FIAT company and Italy's unofficial royal family. For decades, the patriarch of the family was Gianni Agnelli, subject of a recent HBO film, and a man so impossibly stylish that even the normally restless proletariat would simply gaze on mouths agape as he strolled among them, any trace of begrudgery buried underneath waves of admiration. And it was Gianni Agnelli and his wily brother Umberto who instituted the myth of the 'Juventus style'. 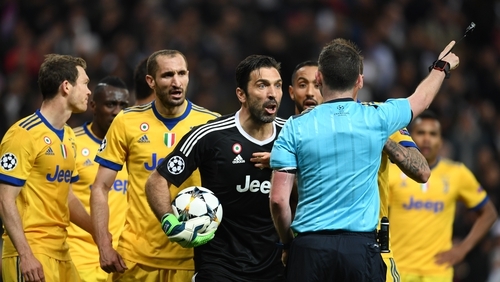 In a nation whose football clubs were infamous for reacting to defeat by pedalling conspiracy theories and howling about phantom refereeing injustices, the 'Juventus style' mandated that its players and officials act differently. The greatly admired Buffon spurned the 'Juventus style' this week and found himself diminished. There's a limit to the amount of moaning one can do even after a genuine sporting injustice. No country knows this better than Ireland. For the first couple of days after the Henry outrage in November 2009, the Irish reveled in their role as victims of an undeniable sporting injustice. It was plain for all to see and we had the world's sympathy. It was almost thrilling for a time. In the midst of all this venting, a few sage voices had the wit to realise that we'd have to rein it in after a while before it became annoying (even to ourselves) and before we embarrassed ourselves. Alas, there was no stopping that outrage train until it careered into trouble and we were duly left mortified once the 33rd team suggestion was gleefully leaked to the public. The FAI spluttered that they'd merely flown that kite as an opening gambit and it was a peripheral issue in their infamous meeting with FIFA. But the damage was done. It was clear that this was embarrassing end-point of all the post-Henry whining and from then on we'd just have to shut up about it. Like the Buffon business, the whole episode reminded us, in the end, of the virtue of stoicism.